St. Mary's, Ga., native Cpl. Ronald Smith, a mortarman of 1st Battalion, 9th Marine Regiment, 2nd Marine Division looks into the crowd of Marines after being awarded the Bronze Star medal with combat distinguishing device May 4, 2012. 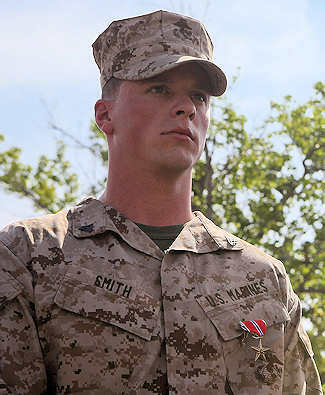 Smith was awarded the medal for actions in Afghanistan, where he moved from cover to retrieve a fallen Afghan comrade in the heat of combat last year. Photo by USMC Cpl. Timothy Solano CAMP LEJEUNE, N.C. (5/14/2012) — St. Mary's, Ga., native Cpl. Ronald Smith received one of the nation's most prestigious combat awards, the Bronze Star medal with combat distinguishing device, during a ceremony, May 4, in front of fellow Marines of 1st Battalion, 9th Marine Regiment, 2nd Marine Division, after an 11-mile battalion hike. Smith, a mortarman with Bravo Company, received the prestigious award for his heroic acts displayed, July 26, 2011, when he saved an Afghan National Army soldier's life. The then-lance corporal left from his patrol base on the summer day, loaded with mortar rounds and his service rifle, prepared for whatever his unit might encounter on patrol. He was the assistant mortar gunner charged with being the farthest rear security Marine alongside “Mario,” an Afghan National Army soldier who Smith had come to call a friend. A detachment of Afghan National Army soldiers had been working alongside the Marines of B Company to eradicate the insurgency in an area called Trek Nawa when a firefight broke out, putting two rounds in Mario's leg. For his actions that day almost 10 months ago, Smith now stood opposite Lt. Col. Tyler Zagurski, a Mercer Island, Wash., native and commanding officer of 1st Bn., 9th Marines, to receive the prestigious award. Zagurski secured the medal below Smith's ”U.S. MARINES” nametape and spoke on Smith's behalf to the rest of the “Walking Dead,” as the unit is called. The sweat-drenched Marines of the battalion took turns congratulating the newly awarded Marine. Afterward, the battalion was dismissed, leaving Smith to look back on his time in Afghanistan before enjoying the weekend with his friends.